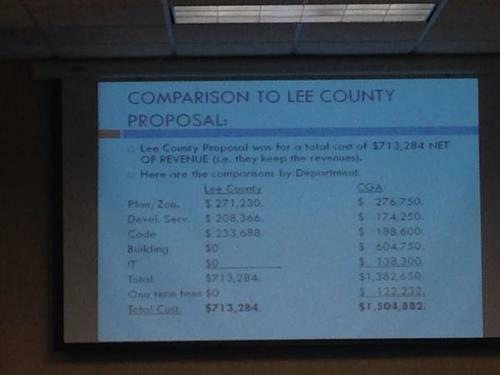 #SWFL Vice Mayor Levitan: Total first-year cost of the community development contract is about $1 .5 million. #SWFL Under the 25-page contract, Estero's community development services would start Nov. 1, Vice Mayor Levitan said. #SWFL Vice Mayor @HowardLevitan is at the podium, explaining the contract before them has three revisions. #SWFL Lee Memorial says it expects to have 258 employees initially: “They will live and work here ..."
#SWFL Lee Memorial timeline: Construction begins in '17; Will be targeted for completion and open sometime in the 1st or 2nd quarter of '18. #SWFL One of the things we are going to do for Coconut Point is master plan the facility and build in phases, says Lee Memorial. #SWFL Lee Memorial: Estero campus will be a "wellness destination"
#SWFL Lee Memorial says it plans to make the health campus a destination that focuses on cutting-edge tech and not just "sick" care. #SWFL The Estero Village Council meeting starts off with a Lee Memorial presentation on the proposed health campus. #SWFL The paint and sip, under a franchise name, is proposed at Coconut Point mall and would serve beer and wine. #SWFL Now someone is explaining what a "paint and sip" business is to the Estero Planning and Zoning Board. 1. "It's not a bar ..."
#SWFL Estero Planning and Zoning Board Chairman Strelow's motion passes. #SWFL Chairman Strelow makes motion to require Bella Terra Village hold meetings with residents to address concerns before returning to PZB. #SWFL Public comment during Bella Terra info meeting is over. Chairman Strelow says the point is to get resident concerns heard early. #SWFL Bella Terra residents are applauding idea of turning the about 12-acre property into a park instead of more homes. #SWFL Pinewoods Elementary School is W of Bella Terra on Corkscrew Road; residents mentioned school buses add to "nightmare" traffic. #SWFL Every speaker from Bella Terra has talked about how dangerous and stressful driving in and out of the community can be. #SWFL Estero Resident Peter Cangialosi: “Do your comprehensive and independent (Corkscrew Road) traffic study first ... Slow down." #SWFL Applause for comment from another Bella Terra resident who said "We need a light at Bella Terra Boulevard (and Corkscrew Road)." #SWFL Robert King, Bella Terra resident: Concerned about safety, traffic and security. #SWFL Estero Planning and Zoning Board moves on to public comment on the Bella Terra Village proposal. #SWFL The about 12 acre site is uplands, per Bella Terra Village rep.
#SWFL People who would want to go west on Corkscrew Road would be turning onto Bella Terra Boulevard first, per Bella Terra Village folks. #SWFL Each unit would have attached single-car garages, according to a Bella Terra Village rep.
#SWFL Bella Terra folks now going over landscaping, buffering, sight lines. Buildings limited to 35 feet, two-story max, per reps.
#SWFL Someone in the audience yelled "yeah, right" and others laughed when Bella Terra rep mentioned traffic reductions. Commotion. #SWFL Bella Terra Village rep says the lot is already approved for commercial and 30 multifam housing units. #SWFL 12.35 acres on the NW corner of the subdivision is the subject of Bella Terra Village's rezoning application. #SWFL Bella Terra Village public information session is up now. Lennar Homes would be the builder, per rep speaking now. #SWFL We've moved on to the Estero Planning and Zoning Board's public information sessions -- informal, non-binding. #SWFL Standing room only right now at the Estero Planning and Zoning Board meeting. Chairman Strelow going over the rules. Roll call. #SWFL The lone action item on the Estero Planning and Zoning Board agenda — Genova's temp sales center — is postponed, per Chairman Strelow.